How do you get to Symphony Hall? Practice Your Viola! I had been meaning to blog for a while and not doing it, but I have a good excuse: too busy practicing. Back in Western New York where I grew up, though, I don’t think we would have called this a blizzard, let alone had two snow days. (Yes, in my day, I really did walk to school uphill both ways in the snow carrying a heavy VSO. Ha!) By tomorrow night, even Boston should be dug out enough to find Symphony Hall. So, it’s the night before the first rehearsal, and frankly, I’m nervous. I applied to the program for both violin and viola, thinking I’d have a better chance with two instruments to choose from. It was a good strategy, apparently, but that means I’ve spent the past 7-8 weeks learning difficult music on my 2nd instrument and getting reacquainted with alto clef. Back in December it seemed like I had a lot of time, too. The concert wasn’t until next year! And there was even winter break in which to practice. So I brought my fresh, shiny, smooth music (Marked “Boston Symphony Orchestra”) along to my lessons. I have a separate viola teacher now, because my violin teacher retired from playing the viola a year or so ago, but she also thought this was a cool experience and wanted to hear all about it. Both teachers recommended that I not only listen to the piece and follow along with my part, but that I get a score and follow along with that. I’m sure reading the score is helpful for violins too, but it seems especially helpful for violas. Sometimes we’re with the violins. Sometimes we’re with the horns. Sometimes we’re just by ourselves, but it’s still helpful to know what everyone else is playing so you know not to come in with them and make a fool of yourself. Sometimes your ear fools you, especially if you’re also a violinist and used to listening to violin parts. 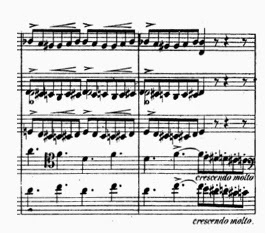 Violas don’t always play the highest note at the highest point of the phrase. I may not get every note. I may still have some occasional violin moments with the clef, but now I always know where I am in the piece. 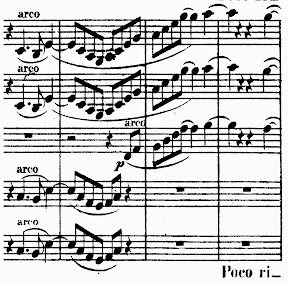 Learning the score, even a little bit, is the best insurance I’ve found against getting lost. Echoing the good advice from other violinist.com bloggers: do what your teacher says. For a while I got into a little practice routine. My regular orchestra started up again at the beginning of January, and out came the violin. On days I wasn’t teaching, I would practice the viola in the morning when I had more time, then put it away for half a day and take the violin out in the evening. Every day, the switching. In the morning: this thing is so huge. It’s clunky and I have to stretch my fingers. This bow is heavy. In the evening: this is a toy. It’s so tiny and the bow is so bouncy. Next morning: this thing is huge and clunky. Evening: tiny and bouncy. Morning: huge and clunky. Now I remember why I stopped trying to play both instruments at the same time. Not much longer now. The viola concert will be over soon. I confessed my nerves to my viola teacher earlier in the week at my lesson, rescheduled just ahead of the storm. I dithered about even going to the lesson at all. Shouldn’t I just stay home and keep woodshedding the parts? But maybe he’ll see something I wouldn’t have thought of. I should go. I went. And I’m glad. While I have some pre-rehearsal jitters, I feel okay. I know I’m not going to drown. My teacher was reassuring and kind. At the lesson we did indeed work on some things I never would have thought of on my own. He gave me some bow hand exercises to increase finger flexibility and recommended using more finger/wrist and less arm in some troublesome passages. 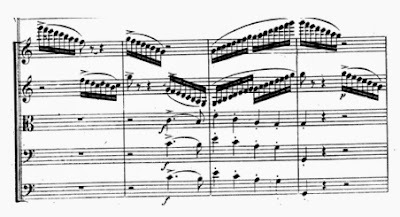 Even my first fumbling attempts at that in the lesson resulted in a clearer and more focused sound in those passages. We also worked on my longer-term project: relaxing my vibrato and making it more continuous. Now, on the eve of the first rehearsal, what I’ve decided to do is to play through the whole program a few times to build endurance. Sometimes I can spend so much effort breaking a piece down into its component parts that I don’t realize until the dress rehearsal, or even the concert, just how looooo-ooong the program really is, and I get tired just sitting there and daunted by how much is still remaining. None of these pieces is particularly bad. At 17:00 exactly, my recording of the Liszt is the longest of the four. But I still find that it’s helpful to know what to expect in terms of length, and to make sure to build in relaxation accordingly. And you know what, sometimes it’s just great to be playing the viola part. Have fun, violinists! Just got an email that the first rehearsal is cancelled, due to the storm. It's really not that bad here in Belmont, but was probably much worse for others in outlying areas. Now our first rehearsal is on Friday night. More time to practice! ;) Have fun with it! I'd recognize those arpeggios anywhere. I've had 2 cracks at les Preludes now, one on each violin part.. can't say I'm a fan yet. Maybe I should try it on viola. 3 times a charm? Have a blast... and be sure to report back. Karen - good luck! I think what you are doing is very exciting. The main thing to remember, as my violin teacher told me when I did Rusty Musicians, is that your practicing should concentrate most on the parts where you are exposed. If you are being drowned out by the brass in a section, don't worry about whether you are doing a really good job on that section. I have only played viola with an orch twice, and my only comment after to anyone was that I had not managed to completely derail the orch. That person's response was that I was not trying hard enough and needed to practice more. However, ever since discussing my new-found viola interest with the violist in the Shanghai Quartet, his one piece of advice was to play only chamber music and avoid orch music as violist. I have stuck with that advice, although given the opportunity that you have, I might want to ignore the advice for one go at it. Anyhow, have fun, keep calm and carry on no matter what happens. Hey, great picture of you on the BSO Facebook page! Looks like a wonderful experience. Thanks for alerting me, Matt! That was quick. It was taken this morning at the pre-concert rehearsal. Glad I wore my T-shirt!